County Wicklow (Irish: Contae Chill Mhantáin, [ˈkɔnˠt̪ˠeː ˈçɪl̪ʲ ˈwanˠt̪ˠaːnʲ]) is a county in Ireland. The second last of the traditional 32 counties to be formed, as late as 1606, it is part of the Mid-East Region and is also located in the province of Leinster. 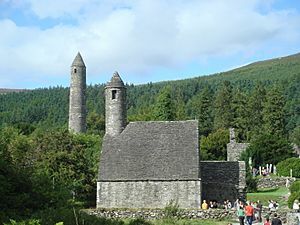 It is named after the town of Wicklow, which derives from the Old Norse name Víkingaló, which means "Vikings' Meadow". Wicklow County Council is the local authority for the county. The population of the county is 142,332 according to the 2016 census. Wicklow is colloquially known as the Garden of Ireland. It is the 17th-largest of Ireland's 32 counties by area, being thirty-three miles in length by twenty miles in breadth, and 16th-largest by population. It is the fourth-largest of Leinster's twelve counties by size and the fifth-largest in terms of population. Between 2011 and 2016 the population of the county grew by 4.2%. The boundaries of the county were extended in 1957 by the Local Government Act which "detached lands from the County of Dublin and from the jurisdiction and powers of the Council of the County of Dublin" near Bray and added them to the County of Wicklow. The adjoining counties are Wexford to the south, Carlow to the south-west, Kildare to the west and Dublin to the north. The Wicklow Mountains range is the largest continuous upland region in Ireland. The highest mountain in the range, Lugnaquilla, rises to 925 metres (3,035 ft), making Wicklow the second-highest county peak after Kerry. The Wicklow Way is the oldest waymarked long-distance walking trail in Ireland, and the area is a popular attraction, as the region offers multiple choices of recreation including fishing before discharging into the Irish Sea at Arklow. The River Slaney is in the western part of the county, bordering County Carlow. The Turlough Hill pumped-storage scheme, a significant civil engineering project, was carried out in the mountains in the 1960s and 1970s. The lakes are small but numerous, located mainly in mountain valleys or glacial corries. They include Lough Dan, Lough Tay, Lough Brae, the lakes of Glendalough as well as the Poulaphouca reservoir (the largest by volume). The county is a popular film-making location in Ireland. Bray is home to Ardmore Studios, where many of Ireland's best known feature films, including John Boorman's Excalibur and Zardoz, Jim Sheridan's Oscar-winning In the Name of the Father, and several Neil Jordan films, have been shot. The BBC series Ballykissangel was also filmed in County Wicklow. Scenes from the movie P.S. I Love You were shot in the Wicklow Mountains National Park while several scenes from other movies, from Barry Lyndon to Haywire, have been filmed in the county. County Wicklow Facts for Kids. Kiddle Encyclopedia.